In the middle of a stone-littered enclosure, on a slant of land tipped into shallow gullies and water-bordered bogs, we admire the Ireland of postcards and musicals. The hedgerows mark out undulating enclosed green fields in damp ripeness, the view trailing off to the cut of the horizon. The rain pitches down in a gentle haze. The little stone-framed enclosures to which I had come, lured by tourist signs, let in tiny glimpses of ancient human craftiness. The ruins of a well lay scattered across ground farmed or neglected for 5 millennia, until recently excavated. The remnants of crude water conduit system. Fire pits. 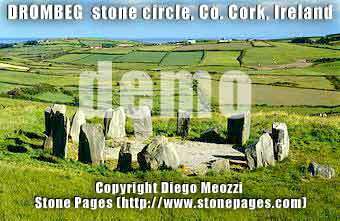 Five-foot high monoliths [DROMBEG stone circle], small clones of those at Stonehenge. Bases of shelters trace out the boggy ground. Not much left. Between now and then, a lot of blood, belief and conflict had flowed through these fields. Between then and now, tears, triumph and disappointment marked the turning time. For these people --their culture and their identity shorn away by successor invaders' swords and ascendant ambitions ---little would remain but a few stones. After all these years of hostility and indifference, a few rough rocks are evidently, belatedly, precious. Of the groups that followed the stonebuilders--- Celts, Saxons, Juts, Scots, Norman's, English --- Irish history would have considerably more to say. In fact, Ireland wraps itself in its history like a shroud. Much of the Emerald Isle's lore seems to involve lamentation, death, or defeat, or depict injustice, or some other sort of fascination with shining examples of Irish disappointment. Funny thing, from a people so famous for literary talent, humour, dancing and music. Or maybe not. Humour sails close to catastrophe and the gallows, and music is the boon companion of a war and funerals. As Orson Welles pointed out in the famous scene from the Third Man, where his character compares Italian and Swiss history, blood and steel produces magnificent art and cathedrals. Peace and efficient social order and tranquility produce the cockoo clock. There are few cockoo clocks in Ireland. Bloody, clamouring history produces picturesque civilizations. Ireland is certainly historically photogenic, with clash and clang to spare. Ireland tends to get a person thinking. Listening, too. Charlotte and I arrived in a busy Dublin in early October 2002, on a long continuous flight from Vancouver via London Heathrow. Catching a bus into Dublin from its northerly airport in the rain, we noticed the trademark Irish characters: flush-faced cabbies and bus drivers, their replies salted with sardonic wit ("We don't rully stop thure [at our particular two-star hotel, about which we will have more to say later]. Moybee you cud joop out as we drive boi." Right to the door he took us, of course with great consideration and courtesy, after entertaining us with Irish version of the universal bus drivers' laments: lousy car drivers, bad signals and rush hour conditions. Not bad start. And all and all. The hotel [which we refuse to name here] stood much more on the outskirts of Dublin's centre than its brochures would have suggested. It lay along a line of four-story houses, many converted to rooming houses and hotels, and apparently known in local parlance as Georgian style structures. A main street swept by, reaching an intersection close on, then heading into the city and to Stephen's Green, at the southern edge of city centre after a journey for a mile or two (or two or three kilometers, if you prefer - the Irish seem to use both measures casually). We considered the Hotel's front. In the middle of the structure, an awning displayed a sign entitled "Raffles," reminiscent of the bar in Singapore, we guessed. On the right wing of the hotel, a series of rooms that appeared to be a bar or restaurant. The center, a four-story block of rooms, bore large, neglected window - mounted flower boxes. In we walked. Later, I came to think of that fateful entry in Stephen King terms: this was our "Shining". Admittedly we never saw Jack Nicholson, but things did get Jack-goofy. We were also to come to learn why wailing banshees are a uniquely Irish folk tale figure. Sent to our room by a staff who stared at us as though we had made some wrong turn and ended up here by some terrible mistake, we assumed our wide-eyed and slightly pitying reception was merely an Irish reaction to a Canadian accent. Or perhaps they knew something. Dreadfully, what? Our room was a large rectangle with four ten-foot high wood sash windows set in 20-foot high walls. It faced the street where we had entered and the parking lot in front. In fact, it was directly under the nightclub's awning. The carpet was a thin, worn, dirt-gray affair, wrinkled into a series of loose ridges that caught your feet as you walked across it. The bathroom was a separate affair, with a large, old-fashioned tub and ancient sink, though in clean nick. An ancient telephone apparatus adorned the loo's wall. We would learn later that it didn't work. The vegetation from the window boxes had grown through two of the closed windows. I attempted to open one. No go. I found one sash would yield. Its pulley balance system had rotted away, so it wouldn't stay open without using a prop. OK. So Ireland's an old and developing country. This is two-star hotel. At $166 (Canadian) a night, we couldn't expect the Four Seasons. But the place isn't a wreck, either. Still, it was clearly a bit of a dump for the money. On our way out to the main street, we took a door out over the back of the place. A steel ramp and walkway led to another large parking lot. The industrial-strength catwalk spanned a one-story addition that appeared to represent a reception or party area. Maybe it was connected to Raffles at the front. We moved on. The lobby, suffused with cigarette smoke, lay out in several areas, spotted with tired furniture. Had the hotel had any smoke detectors, undoubtedly they would have gone off, awakening the bugs in the sofas. The restaurant/bar, inhabited by several beefy, ancient and bleary-eyed denizens, didn't offer much of a prospect for digestible food or breathable air. We wandered up the street with a narrow sidewalk fronting large houses or hotel conversions of houses, with walled front-door parking lots. A neighbourhood on the way down, it seemed. After a few blocks we discovered a large, modern-looking hotel with a giant pub off its main floor lobby. We bought a meal from a buffet concession; manned by a lad who gave us a large smattering of every food item we considered or inquired after. As a result we had a giant plate so laden we shared it. We had a few local drinks in a beautifully decorated bar. We noticed a club attached to this hostelry too: this one called Annabel's. Pubs with club -- an Irish signature in large towns. For those who sleep, they were best avoided. I wonder how the noise works? A passing, faintly dreadful thought tripped across my jet-dazed excuse for a mind. We drifted off home, yearning for a big sleep to take the edge off the time lag and two days' wakefulness. Sinking into our large bed, we notice that springs poked through the fetid and stained mattress and sheets. Too tired to care, we stuffed an extra pillow onto the worse of the metal bed daggers and drifted off. At about one the auditory crap hit the rotors, so to speak. Crowds of yelling drunks arrived. Electronic sounds blasted up through the floor, recycling a tortured four beats, punctuated by what vaguely resembled singing or wailing or primal screaming. That went on for the next seven hours. Exhausted and in auditory shock, we tried the phone to the front desk. Dead. We considered getting up and complaining directly to the rioters. We thought better of it, considering their language and behavior. Besides, clearly the hotel's proprietors had lured these customers there for some titanically noisy spectacle. We were attempting to sleep in the middle of heavy metal trash band concert. We considered leaving. Where would we find a hotel at this hour? We toughed it out. At 6:00 the "music" stopped. The crowd noise and cursing went on for two more hours. To sleep, perchance to dream? Not for a minute. In the morning we went to breakfast, in a lovely, spacious serious of rooms facing the street. Freshly painted they were. Lovely new carpet. Hardly the same building. We had clearly come from the shabby wing. The only resemblance to our room lay in the large windows with the rank weeds and flowers growing through the closed windows. We faced a lovely "traditional Irish" breakfast, a lot like a traditional northern English breakfast, suffused with greasy eggs, bacon, blood pudding and toast, and a buffet of yogurt and cereals. Lovely. We should have been ravenous after lying awake all night. However, we were almost too tired to eat, and anxious to berate the management and bug out to better digs. After breakfast, we informed a stunned group of desk clerks and the manager that we were leaving, and why, and asked for letter to testify to our one night's stay, since we had prepaid for three, and would have to chase a refund. "I can't give you any money," the middle-aged, earnest manager declared gratuitously. Of course not. That would be too simple. Call us a cab, we asked. The staff did that very well, though they seemed vague on the whereabouts of downtown Dublin's Nassau Street, running by Trinity College and the main tourist information office. Ireland's Fawlty Towers it was, without the humourous characters. And off we went to the next hotel, in this case off tourist-busy Grafton Street. Lovely place. Noisy, too, situationed next door to a giant, multi-floored pub called Break for the Border. Open all night, the pub below our room resonated with some of the same banshee activity we found before. Except this time the windows were somewhat soundproof, and the décor and hygiene didn't set you to scratching at the thought of sitting or lying down. The streets below were still a cynosure of a clamour for a band of sloppy drunks late at night. But that, we came to learn, is just Dublin. Bring earplugs if you want to attempt sleep in the historic center anywhere near by, the museums or Temple Bar and the Liffy. Our travel agent told us this after our Dublin experience. Gee, thanks. Our car journey began two days after our stay in the hotel from hell. Two nights semi-effective sleep in a clean hotel, and breakfast and dinners in Bewley's and other good restaurants on Grafton Street, made us feel considerably better. We took in the typical ambience of Ireland, seen and heard and inhaled from bus tours and museum visits, and a night out at the theatre. The languid cruising along Ireland's southern coastlines even healed the wounds from septic bedsprings and tortured eardrums. On the road south we went, from Dublin to Wicklow, then to Wexford, to a lovely, house-based B and B on the hill in "Newtown," between the freeway and the village center by the Irish Sea. Our first stop Dublin took us to Wicklow, and a lovely pub at the entrance to a sea-framed town with a quaint, old main street, and a crisp waterfront dotted with a few small boats. After a fine lunch in the modern pub, a quick turn through the town, back out the way we came, and back to the freeway we went. On to Wexford, our B and B destination for the night. Wexford has found an attractive balance between touristy narrow streets with bright shops selling modern merchandise at good prices and the crumbling quaintness of other times, conveyed by old or faux-old storefronts. Old churches, Norman walls, ancient ramparts and harbour walls give the town enough sense of a relic-strewn past to satisfy tourist sensibilities. Good restaurants and smoky pubs purveyed "traditional" music with modern European cuisine. Plenty to satisfy the tourist yearning for the authentic blarney, yet with a ring of honesty. The smooth road from the town below up the hill to the freeway south featured red-coloured bikeways and landscaping leading to a New Town. Lovely spot. Fine service and hospitality, too. Ireland's best face. Our next stop came after a day winding through narrow hedgerows to, along and then away from the coast. Through Waterford, the large commercial center on the southern coast, down narrow streets of small towns linked by hedge rowed roads or pinched passages ending at a seaside pub or clump of houses. Heading northwest for a time, we skirted the southern edge of Cork, and headed south to Kinsale. The sea and fertile land tugged at the edges of each other all along the perimeter of the town. A wooden dock extended along the edge of the village. The harbour consisted of a series of long, interlaced coves defined by steep-banked fields that rose up from the sea's banks, crowned by farmhouses and the homes of the town itself. Like so many burgs on the southern coast, tales of Spanish Armadas, Norman conquests and lonely, dashed hopes of Irish independence rung round the place as romantic nostalgia. Meanwhile, the townsfolk got on with apparently prosperous lives, surrounded by lovely architecture, even more beautiful hills and harbours and serenaded by a rich lode of musical talent in the pubs and restaurants. Ireland's newfound affluence in the European Union accounts for much of this fine display of gentility, we were told. Dis globalisation is a foin deal, don't ya know? Our B and B lodgings lay at the top of what appeared to be the highest hill in the town. As we wound our way up a city street of houses with progressively more modern lanes and homes, the town gave way abruptly to fields, rising up behind the apex of the slopes above the town. The street turned for one last climb to the summit and at the top, just as we reached the last house on the hill-top side, an undulating expanse off in every direction. The road continued on a few more hundred yards, now with sprawling, big-lot houses facing horse pasture, blue sky, and the sea beyond. Looking down-hill to town, the narrow curves of the large harbour lay painted by the town's buildings on one concentrated side, and by a smattering of houses and farms off into the distance. Sea and sky held the town in its arms. We pulled into the parking lot of a large rambling house with a half-acre of back yard perched on the hill. A child's swing offered its riders a grand view of town and harbour. So did our bedroom's window, we found out. The picturesque count had certainly risen a few notches. After a lovely night on the town, listening to jazz in one pub, traditional Irish harp and song in another, we climbed the dark hill through the suburbs, up onto the road along the hill at the top of town. Street lamps gave way to country murkiness for the last few hundred yards. On our left a field's moonlit expanse indulated off into the darkness, the sea's shining reflection visible in the dark distance. On our left, a series of large houses and their porch and interior lights guided our path on the road, but didn't prevent us from treading on the odd bun of horseshit scattered by traffic. The romantic spookiness of it all provided just the right kind of delicious mood to match our boozy festiveness. The next day, we broke for (I'm adopting local expressions by this point) Kenmare, along a route across the southwest peninsula of Ireland, along the most lonely and stark landscape of our journey. Narrow, winding roads took us through, over and around rocky outcroppings bordered by barbed wire fences which the local sheep treated with insouciant contempt as they slept and lounged on or beside the road as we drive by. Carefully. No sheep darted in front of our car. They sauntered instead. These guys knew the routine. Well in front you, a couple of sheep types, some carrying spashes of red paint, would meander with watchful eye directed at the car, with scarcely a "baaah," across the tarmac. Gearing down, I would slow to a mere crawl and drive by the smugly chewing woolly creatures. Natural decelerator bumps, with a comedic bucolic flavour, they were. And so we drove through such rocky terrain for several hours. At one point we stopped a small lake buried among hills. Rock and moss, and little grass, and no-one but a few sheep were about. They gazed down on us from up on the hills looking over the road. Beside the pavement, they insouciantly lay or grazed or strode. Quietly chewing. Ho-hum. Or perhaps baah-hum. On we wound through this desolate, quiet and pretty land. As we neared Kenmare, hills steepened and vegetation became, well, more lush, but hardly that. We came upon a tree farm, mostly clear-cut and recently replanted. Farm land displaced the earlier desolation. And then, Kenmere's main street came up in the windscreen. A toy town, almost, with early 20th century pubs and shops, lovely park verges, side-barred parking areas along the main street and around a couple of squares. Two main streets bisect the town. Flash restaurants and shops displayed clothes and tourist talismans of every shape and price. At the end of the street we turned left at a large-lawned verged cross-roads and headed on an undulating road out of town northeastward, for a mere few hundred meters. Up on the right, among three other houses of simple mien and purpose, lay our B and B destination: a large square house with wall-enclosed yard, lovely rockery landscaping. Our modest-sized room contained the usual mod cons, although they were longer in the tooth and less luxurious than were those in our previous two places. We walked to town along our country road for several hundred meters, then strayed off the road onto a dark, tree-lined dirt path, clearly marked for that purpose, that led us by several dark and silence houses and field of sheep into the back of the town. Once clear of the field's rock fence, we walked through the back of a housing development, several repair shops, across a small bridge spanning a narrow, fast-flowing stream to the back end of the town square we had driven by some hours earlier. At the edge of the stream hung an apartment whose structure merged with a pub and craft shop. After a wander through town, we retreated to in a restaurant and a pub. Hours later, we retraced our steps to our lodgings via the dark, unlit corridor, out to the country road and home. We figured our red LED light purchased from Lee Valley helped our way, as we flashed its beam at oncoming traffic as we shambled along a narrow road verge to our digs. Aside from an occasional car, all was silence. The next morning, following a compulsive, self-inflicted iron rule whose origins remain obscure, we were off again. We couldn't seem to stay two nights in one place. In motion, there was more meaning. This time we aimed for Dingle, the western town so prominent in Irish tourist mythology that it has its own Hollywood Walk of Stars. In spite of that, we went there, to a lovely B and B, and an alluring town, too. The hotel sat up on the hillside looking out over the harbour. Its proximity and orientation to the village was almost identical to the situation in Kenmere, except our front lawn prospect was a meandering series of small and large harbours leading out the sea to the east. In contrast, at Kenmere our prospect consists of long views of green fields and hedgerows. Lovely, either way. Dingle hardly flaunts its fame, except for the Hollywood walk and vague mention of Julia Roberts and few other Hollywoodites around the town. Restaurants were plentiful and high-end, and Dingle features enough pubs with traditional music to satiate the biggest fan of Michael Flattley and his troupe, of which I am a slightly abashed member. Charlotte's appetite for fiddles, pipes and heavy stomping can be much more easily satisfied than mine, particularly since these fine Irish musical traditions usually come with heavy clouds of smoke. After Dingle we found Athlone, Drogheda, Portmarnock and Dublin airport. 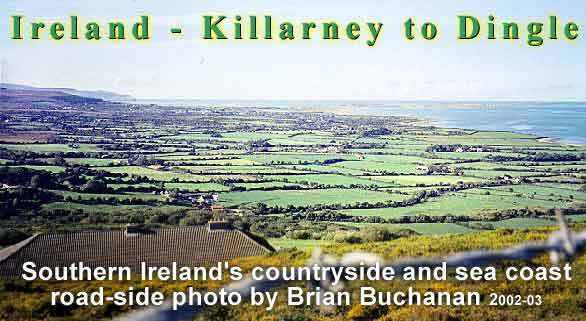 Pretty, and pretty interesting they all were, too, though once we turned back east, away from roads leading to Killarney, and into the heart of the island again, the country and towns became more sedate, less spectacular, and the B and B's less luxurious. Still, it was, all and all, a foine 'ting, was Ireland. I still don't quite figure the screaming drunks in the wee hours, though. An atavistic cry of outrage over some ancient slight? I'm sure the English are ultimately to blame: One cabdriver told us that late-night partying was a mere manifestation of the New Ireland's wealth. So all the late-night clamour is England's fault, since a Britain is a linchpin of a united Europe. Hmmm. Meanwhile, we were off to London, and to our lovely, quiet flat in Ealing, leaving Killarney and Ireland's north for another trip. read Winter Olympics 2010 in Vancouver? - an editorial on "The Pains and Other Deeper Aches of Being World Class"